Bernie Goldbach in Clonmel | Photo of Irish Examiner. 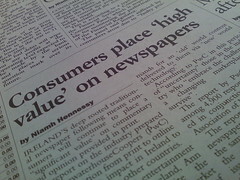 IRISH NEWSPAPERS HAVE started invoicing agencies that link to their content. If this unwelcome industry practise creeps into academe, it could stifle the delivery of high-quality content. As the senior creative multimedia lecturer at the Limerick Institute of Technology, I write content in the form of Acrobat documents, e-books, Powerpoint files, public Evernote links, Google documents and Slideshare presentations. All of these documents gain a share of their relevance through occasional hyperlinks to Irish newspapers such as the one shown above in this blog post. Based on a billing mechanism developed by the National Newspapers of Ireland, I could be liable for payment simply because I put links into a bibliography section of an academic document. Since I cannot honour a demand payment, I am modifying the hyperlinks to ensure they do not point to the newspapers. Furthermore, I am removing most of my academic material from public view since I know Meltwater, Google and other crawlers have discovered it during the past three years. It's an issue that has merited discussion on This Week in Google and on For Immediate Release, the premier business podcast where I've left a comment. Bernie Goldbach in Cashel | Photo of Temple Bar. SPEAKING FROM EXPERIENCE, Dublin deserves to be named as one of the top five places to spend New Year's Eve. Temple Bar is well-lighted for the occasion. 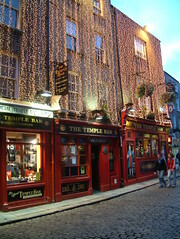 It's old news by this time because several months ago The Lonely Planet travel guide listed Dublin as one of the best places to ring in the new year and every street in Temple Bar (see photo) is in a welcoming mood. Others include Prague, New South Wales coast, Chiang Mai in Thailand and the French Alps. Another High Culture event for the new year in Ireland is Castlecomer's annual Wellie Race. We've seen that several times, once observing a horse-drawn cart catch fire in the middle of the opening parade. Recommended. Bernie Goldbach in Cashel | Image from GitHub. MY LIFE IS BETTER after connecting GitHub to Evernote. The connection makes it very easy to search only my watched repositories. I like watching GitHub repos because one day I might need to use a library that I've added to my watched repos list. It's very easy once you authorize GitHub access to your Evernote account. You just enter your GitHub user name and choose an Evernote notebook. The ReadMe of every "watched" project will be added as a note to your chosen notebook. GitHub repos are refreshed every 24 hours to check for ReadMe changes. Once the ReadMe changes, your Evernote folder will update too. If you plan to use Evernote in this fashion, I recommend mapping your GitHub updates to a specific folder or setting up a separate free Evernote notebook if you're concerned about security settings. Bernie Goldbach teaches part of the creative multimedia degree programme in the Limerick Institute of Technology. How does git push work with android's repo tool? Bernie Goldbach Cashel |Photo of the 200 item bookshelf. QUANTITATIVE ANALYSES across 27 nations have documented the positive effects of book-lined shelves in homes. Children who grow up in homes with 500 or more books enjoy positive intellectual advantages. I read these analyses more than 10 years ago when reviewing common traits displayed by successful applicants to American Ivy League colleges. “Home library size has a very substantial effect on educational attainment, even adjusting for parents’ education, father’s occupational status and other family background characteristics,” reports one published in the journal Research in Social Stratification and Mobility. “Growing up in a home with 500 books would propel a child 3.2 years further in education, on average, than would growing up in a similar home with few or no books." Bernie Goldbach in Cashel | Screenshot from Statcounter. 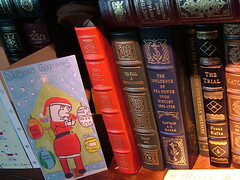 I WATCH MY BLOG to get an idea about what kinds of technology people get around Christmas. This year I noticed queries about Kindle, Skype, and iPad apps. Although several of my friends think dedicated e-readers like the Kindle have peaked in the market, I don't agree. I think Kindles have carved out a sustainable niche. I get a lot of use from my Kindle mainly because of its long battery life and crisp e-ink technology. I don't get the same results from the Kindle apps I use on different touchscreen phones. Christmas visitors wanted to know about Irish newspapers on Kindle. I subscribe to The Irish Times on Kindle, the third most popular Kindle newspaper in western Europe. I need to write a separate blog post about using Skype to call an Irish mobile phone. It's a recurring question that I see in my referrer logs. Around holiday periods, Irish emigrants ask that question before they use Skype to call friends in Ireland. The audio clip below covers a few of the other topics that were raised by people visiting InsideView.ie on Christmas Day. At the time of this writing, 21% of visitors to my blog were using a mobile device and half of those mobile visitors used an iPad to read my blog posts. Bernie Goldbach uses his blog as a journal. Bernie Goldbach in Drogheda | Little Dylan on the mic. I LEARN A LOT by listening to my children. And I learn a lot of what I've missed by listening to others tell me what they're hearing. That's happening now during the holiday season as our year-and-a-half-old crawls at high speeds towards new things he can see within his reach. 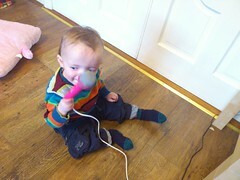 He discovered a karaoke machine on the floor of his cousins' sitting room and immediately began using the mic as it was designed. He imitates what he sees around the house, giving me a view of what I might see in the mirror. I've started making short audio recordings of him interacting with his world. I'm using the Audioboo app to make and share his noises, then saving the uploaded audio into my Evernote account where I've a folder just for Dylan Goldbach. Dylan's vocabulary is very limited at the moment but his reactions are very astute and he commands responses from the big people in his life, even people who have never seen him, like Jackie Rumble (aka TheBooMagnet) in Canada. She made the audio clip below. Bernie Goldbach is keeping Evernote journals for the kids. 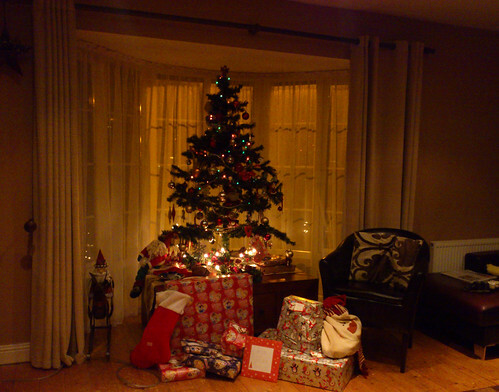 Bernie Goldbach in Cashel | Photo snapped in the sitting room. WE WILL REMEMBER Christmas 2012 through the joy expressed by two children who shared the festive occasion with family and neighbours. The kids make Christmas one of the most special times of the year, something we know because we can toggle into the sights and sounds of Christmas Past. We shared "openings" via YouTube, Audioboo and photostreams because it's important to have these little snippets stored away to enjoy smiles decades later. For that, there's Evernote. I've tagged this special day as "Christmas" and shared the folder with our five year old. Next September, I'll pay for her own account so she can upload audio clips, video fragments and megapixel images of her own. Bernie Goldbach collects memories, including hours of listening on Audioboo.fm/topgold. 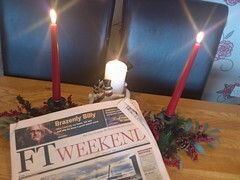 Bernie Goldbach in Cashel | FT on the kitchen table. AUSTERITY MEANS fewer champagne corks and lower cost Christmas toys in many parts of the European Union this December. It's front page news on the Financial Times this weekend and part of my Audioboo. There is a moroseness, "a sadness among the French population at the moment," says Paul-Francois Vranken, chief executive of Vranken Pommery Monopole. The gloom has deepened during the past two weeks with Irish newspapers watching the open spat between the French socialist government and prominent French citizens. Faced with paying 75% of their earnings over to the State as taxes, a number of well-known Frenchmen are handing in their passports and setting up residency in lower tax regimes such as Belgium and England. And although socialists in Ireland are watching this happen, they continue leading a crusade to squeeze upper income earners through a wealth tax or a higher margin on earnings above EUR 100,000. This would damage wealth creation if implemented as a government policy. I explain this in a short audio (above) and in a YouTube clip below the break. I'm thinking about techies like Loic Le Meur and wondering how all this socialism might affect their entrepeneurial spirit. And for the record, I've been a regular FT reader for a decade. 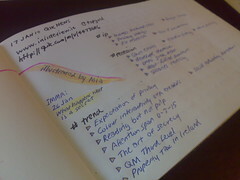 Bernie Goldbach in Cashel | Photo of a Moleskine note. I SPEND A FEW MINUTES every two months setting up the front and back matter in my Moleskine journals. I have started thinking more about elements of manuscripts since becoming immersed in Scrivener. Title Page. If I ever hope to create an eBook from one of my Moleskines, I need to create the title page that automatically opens when viewing my (upcoming) Moleskine book on an eReader. The title page is minimalist. It show the book’s title, author’s name, and publishing company. Dedication. Witty dedications work best. They help readers bond with authors (or discard them as a result of a confusing dedication). Copyright. I've started putting Creative Commons Copyright images directly on some of my Moleskine pages because I'm snapping and saving the pages into Evernote where they can be shared with the world. Epigraph. I'm saving quips and quotes for the beginning of my Moleskines. They can help put my journaling into context. A lot of the fragments we hear uttered by our five-year-old would fit as epigraphs. Preface. I visit the preface of my Moleskines to update myself on how my journaling has evolved. A good preface also frames the context of my current journal. Back Matter. I've learned to appreciate back matter after purchasing dozens of Kindle e-books. Note from the Author. I write a note of thanks to readers, imagining that my grandson will stumble upon one of my Moleskines and discover something I've written for him. Notes from authors also passes along contact details, escpecially the hyperlinked places where they can hear me talk through earbuds. Just like Eoin Purcell, I believe the "best time to sell to a reader is when they’ve just finished enjoying one of your books". Bernie Goldbach wants to write more. And get paid for it.